So normally, I am much more organized in advance with my dinner parties but my Cinco de Mayo taco party last weekend.. well, clearly just didn’t happen. I usually throw food parties midday Sunday because it gives me all Saturday to prepare, but my friend Cherie (who has never missed any of my kitchen adventures) asked for Saturday night so I acquiesced. Saturday morning comes and I call up my chef buddy Drei to help with my very last minute menu planning. I asked him if there was anyway to make pulled pork without having marinated it properly overnight as I had failed to buy the meat ahead of time; he chided me as usual and said don’t even bother trying as it would have no flavor — basically it was gastronomic blasphemy to think I could do a quickie pulled pork. 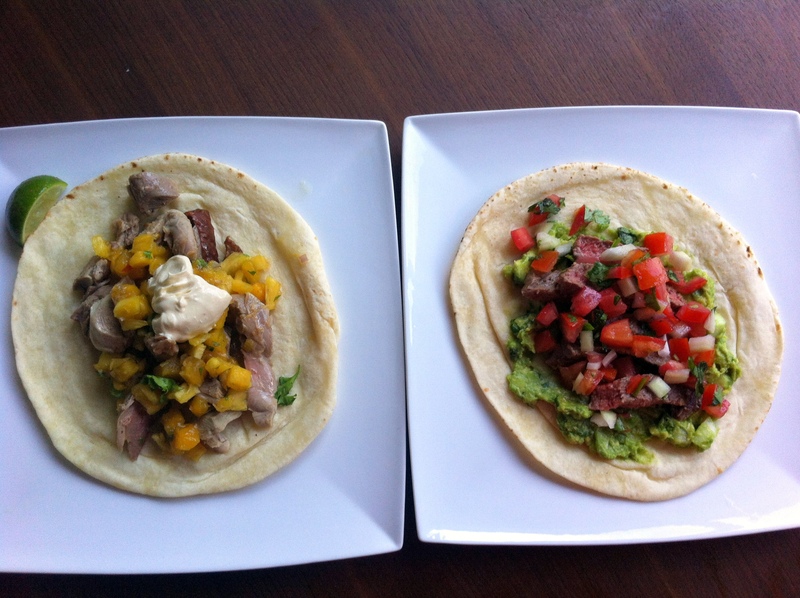 So we went through all the quick cooking taco recipes and came up with Skirt Steak Tacos with Guacamole and Pico de Gallo and Pulled Duck Tacos with Mango Pineapple Salsa. The latter is Drei’s favorite taco and he recently made these for Singpaore’s Hit the Roof with Edible Gardens & Friends Party that he helped organize with his restaurant. 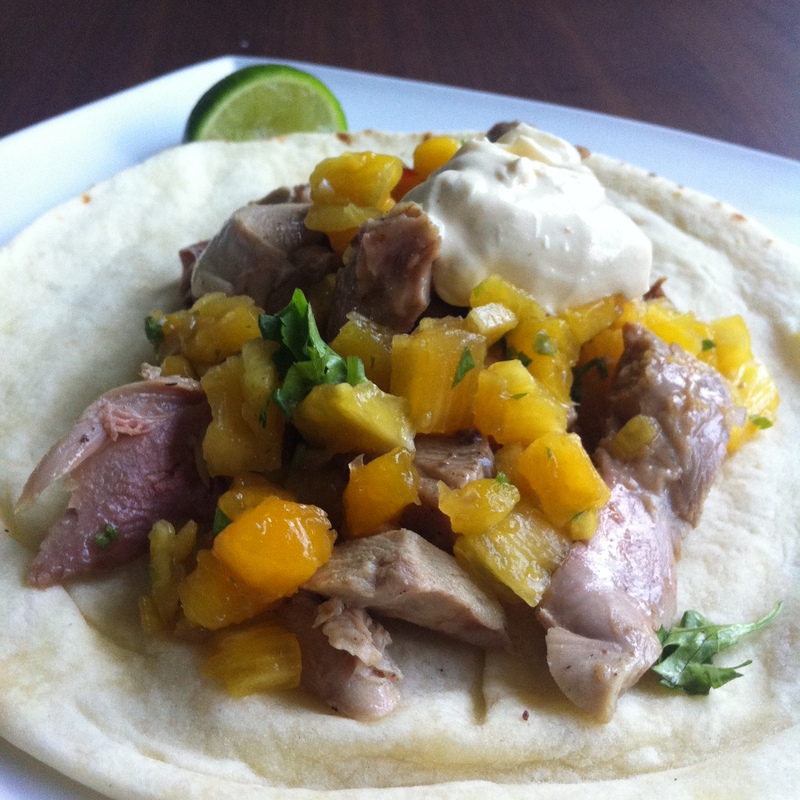 The sweet fruit salsa went so well with the rich, fatty duck — these tacos were sold out very quickly at the event. The recipe is a bit of Asian-Mexican fusion as it uses Chinese-style roast duck (think Peking duck) that is shredded and topped with Mango Pineapple Salsa and a Hoisin-infused sour cream. 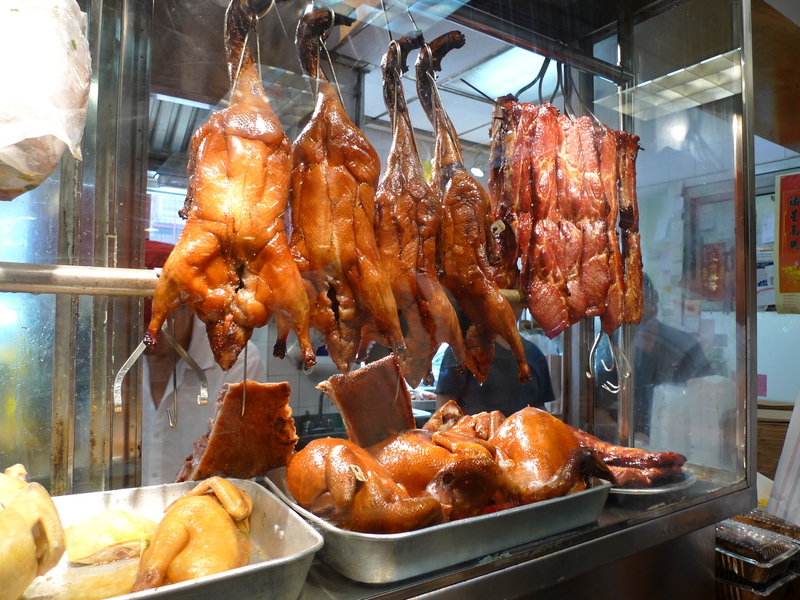 The recipe was easy because obviously I did not roast the duck myself; instead I bought a whole roasted duck from one of the Chinese hawkers in my neighborhood (elsewhere, Chinatown will have plenty of these hanging from the window). Do not have the butcher chop it up for you, just buy it whole as it is much easier to pull the meat off that way. If they cut it for you, you are going to have the arduous task of separating all the bones and inevitably fail at it. Hand pull the duck meat from the bone. Don’t be shy, get in there. Throw in some of the glazed crispy fatty skin as well as there will always be someone who wants to eat it. Prepare the mango pineapple salsa – recipe is here. Mix together the dice mango and pineapple, minced red onion, cilantro and lime juice. In a small dish, mix together the sour cream with hoisin sauce. I used a 200ml tub of sour cream and whipped it with 1 tablespoon of hoisin sauce. The sweet and salty hoisin sauce mixed with sour cream creates an unbelievably smooth condiment. 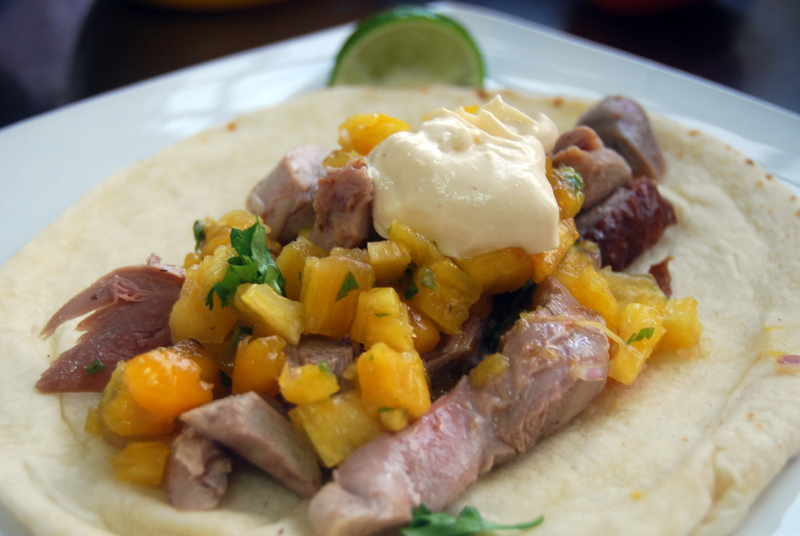 Assemble the tacos by starting with some shredded duck meat, spoon the mango pineapple salsa on top and top with the hoisin sour cream. Enjoy!